With Gravity Science Mod, you are ready to mess with gravity and make pigs float. This mod provides you with some cool blocks into the game that allow you to alter the physics in Minecraft a bit and make pigs fly. 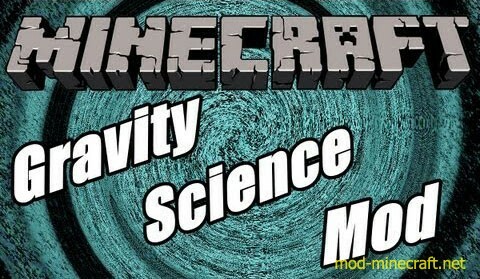 Gravity Science Mod adds 3 blocks and 1 item. All the blocks are redstone triggered. They light up when they are powered. This block disables gravity for 12 blocks in all directions. The affected entity(ies) will float and move slowly but smoothly. If you turn off the block all entities will fall, and take fall damage accordingly. This block disables gravity in front of itself with a range of 12 blocks. The entity will float and move slowly but smoothly. If unpowered the block all entities will fall, and take fall damage accordingly. If the entity moves too far from the front of the block, they will fall. This block disables normal gravity and creates a gravitational field around it. This will attract all entities in a 12 block radius in all directions. Entities can reach a high speed and fly very far away if it is turned off while they are moving. This block acts the same as the attractor, except the gravitational field is in front of the block. As usual, this field will attract all entities. Entities can reach a high speed and fly very far away if it is turned off while they are moving. If they move too far away from the front of the block, they are no longer attracted. Same as the Attractor but repulse instead of attracting. Same as the Directional Attractor but repulses instead of attracting. It protect the player from the blocks’ effects if worn, or if merely selected. However, if you do not have them selected or worn, you will still be affected like any other entity.